The links for many popular Mac apps on CNET’s download.com have been replaced with a “CNET installer” that installs toolbar adware and changes browser settings. This guide shows how to identify affected apps, how to avoid the toolbar installer, how to determine if it has been installed on your system, and how to remove it if so. To determine if a specific app is affected, go to the CNET download.com page for that app. If you see “CNET installer Enabled” listed on the “Download Now” button, it means that the app is affected and will download the toolbar installer if you click that button. If you see “CNET Secure Download” listed on the “Download Now” button, it means that the app is not affected, and will download correctly if you click that button. If the app you are trying to download has “CNET installer Enabled” listed on the “Download Now” button, there should be a link below the button listed as “Direct Download Link.” Clicking the direct download link will download the app, and not the toolbar installer. The easiest way to avoid adware installers like this is to only download software through the Mac App Store, or directly from the developer’s website. In Safari, click the Safari menu, then click Preferences. On the Preferences screen, click the Extensions tab. 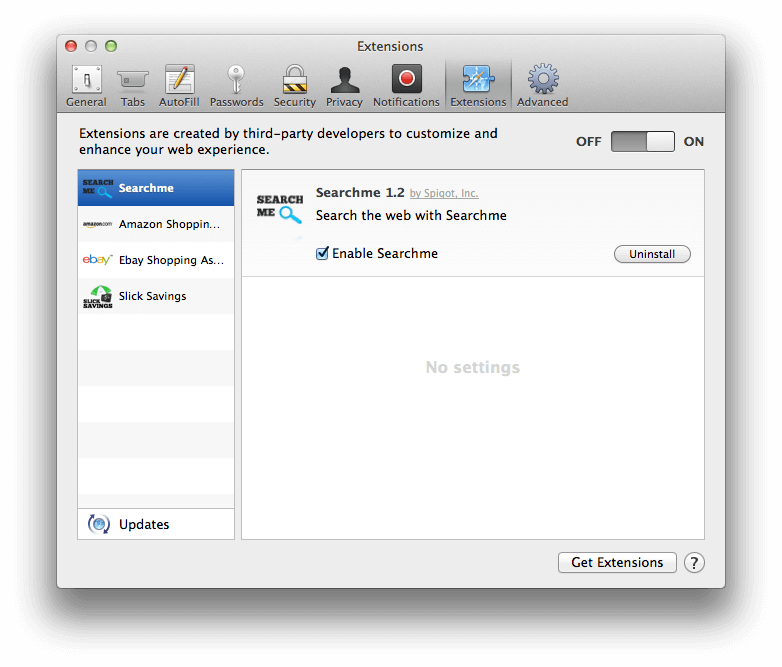 Click the “Uninstall” button for the Searchme, Amazon Shopping Assistant, Ebay Shopping Assistant, and Slick Savings extensions. In Chrome, click the Window menu, then click Extensions. 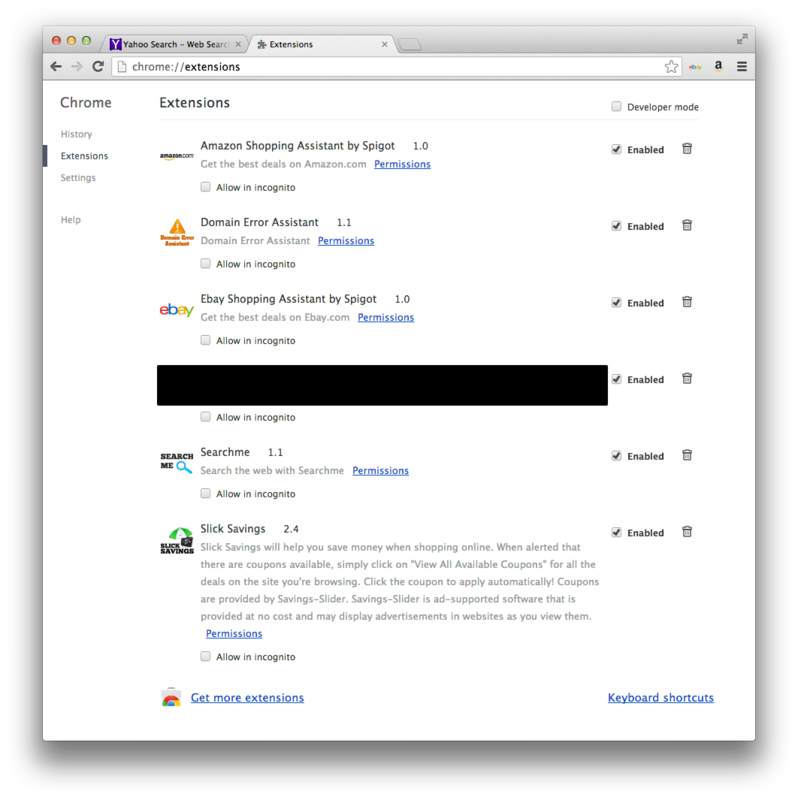 On the Extensions screen, click the trash icon next to the Amazon Shopping Assistant, Domain Error Assistant, Ebay Shopping Assistant, Searchme, and Slick Savings extensions to remove them. 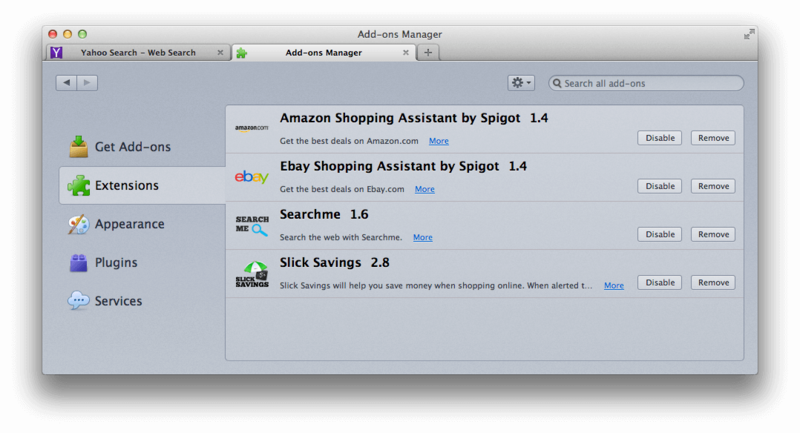 In Firefox, click the Tools menu, then click Add-ons. Click the Extensions tab in the Add-ons Manager. Click the remove button for the Amazon Shopping Assistant, Ebay Shopping Assistant, Searchme, and Slick Savings extensions. On the Preferences screen, click the General tab. Select your favorite search engine from the menu next to “Default search engine,” and enter a website for your Homepage. In Chrome, click the Chrome menu, then click Preferences. On the Chrome Settings page that appears, choose your favorite search engine from the list under the “Search” section. To change your home page, go to the “On startup” section, and click “Set pages” next to “Open a specific page or set of pages.” Delete the startup page beginning with http://search.yahoo.com/?fr=spigot-yhp-gcmac… by clicking the X button next to it. Enter a URL for the home page you would like to set, and click the OK button. In Firefox, click the small downward pointing triangle icon in the search bar, then select your favorite search engine from the drop down menu. Then, click the Firefox menu and click Preferences. On the Preferences screen that appears, click the General tab, and enter a URL for the home page that you would like to set.